Six Flags Entertainment Corporation (NYSE:SIX), and Samsung Electronics America, Inc., today announced a broad marketing partnership which appoints Samsung as the “Official Technology Partner” of the world’s largest regional theme park company. 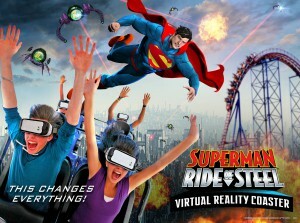 The partnership includes the debut of ground-breaking experiences coming to nine Six Flags parks – North America’s first Virtual Reality (VR) Roller Coasters, using Samsung Gear VR powered by Oculus. For more information, visit www.sixflags.com/virtualrealitycoasters and www.samsung.com/gearvr.